The Nissan Silvia was not named after poet Sylvia Plath, and owning one shouldn't be as tortured an experience as was her short life. The U.S. version of the Silvia — the 200SX, as represented by today's Nice Price or Crack Pipe custom convertible, may be ode-worthy, but is this one's price too much to be owed? You know that show - Jon & Kate Plus Eight - and how it turned out that Jon was a D-bag having left his wife with like a ga-jillion kids so he could go sow his seeds elsewhere? Yeah? Well yesterday's 1973 Ford Country Squire would have been the perfect car for Kate to cart around her horde, as well as potentially run D-bag Jon over in, it being damn-near three tons. It also proved to be a heavy favorite of 55% of you, who awarded the massive beast with a Nice Price win. Smaller, more toplessier, and a whole lot more Datsunnier is today's 1983 200SX with a convertible conversion by American Custom Coachworks, LTD, of Beverly Hills, California. A claimed one-owner car with just 53,000 turns of the odometer's right-most wheel, it's still shiny, has all its parts, and has a top that goes down like free beer. 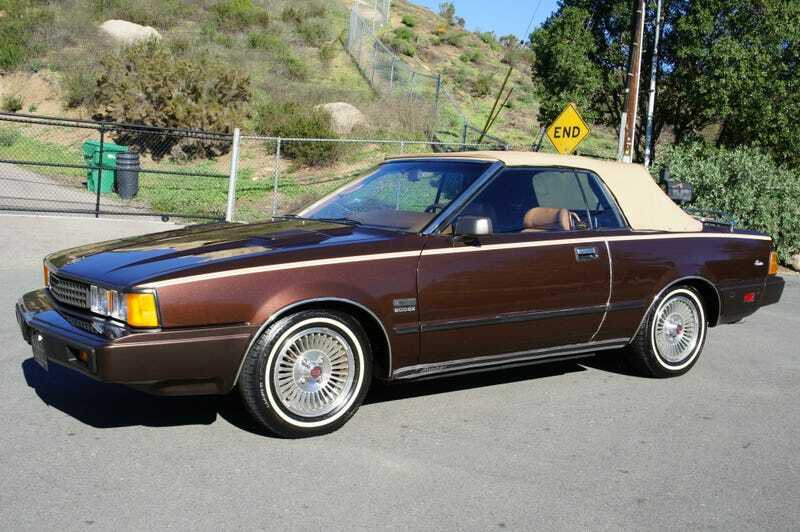 Oh, and it's painted in glorious metallic brown. The 200SX served as Datsun's Celica in the highly competitive import pony car wars that grew out of the seventies. Like Toyota's personal coupe, the early ‘80s version came with styling from the origami school of thought, featuring severe angles and edges sharp enough that you could cut the cheese on them. That S110 edition, as represented here, expanded the body styles available from one to two with the addition of a hatchback model. This custom convertible is based on the coupe, and is all the better for the removal of the car's awkward notch-back roof. The work, done by limo-builder, ACC, looks to be first rate and includes both narrowed rear seats to accommodate the top, plus retractable sidelights making the whole thing look pretty factory. Sadly, like many factory tops, the rear window is plastic and suffers from the miasma of age so common with these impermanent things. Opening up the top reveals an interior resplendent in an unearthly orange-brown hue, with styling equally as square as the outside. Typical of the era, it's all plastic in there, but you do at least get all the power accessories a sluggard could want. Adding to the sloth is an automatic transmission, and a 3-speed one at that. A neat feature - one that was somewhat of a big deal at the time but then seemed to fade away - is that this is a talking car. Sure, these days your GPS will tell you where to go, but this one will tell you in a real person's voice if a door is ajar or your fly is open- from way back in 1983. Think of the benefit to blind drivers! If that disembodied dashboard voice wanted to blab about the engine, it would probably say that it is Nissan's 2,188-cc Z22E, which sports fuel injection and a single, chain-driven, overhead cam. She might also mention that its good for 103-bhp, and puts the power down through a live rear axle and a set of, rare for the day, alloy wheels. What she might keep on the DL is the fact that overall, the car has the appearance of a Chrysler K -kar konvertible. At least the right end is driving it. The car may be clean, and the convertible conversion unique, but the best part of the seller's eBay ad is his video. That's because it is clear that the narrator knows absolutely nothing about this car, and possesses only limited knowledge of autos in general. The 200SX has had a reflector mounted between the lights, a common aftermarket fitting back then, and something you'd see on 924s and the like. As such, the license plate has been moved to a cheesy bracket mounted to the bumper, and leading the videographer to posit that the car is JDM or grey market or something. It's comical, but at a total length of 14 minutes without commercial break, it requires something more than my ADD attention span to sit through. The 200SX eventually morphed into the 240SX, which has become a dream drifter for the sideways crowd. These early cars, and especially one whose lid has been flipped, wouldn't make for much tire-smoking fun, but that doesn't mean this car shouldn't have a place in some appreciative buyer's garage. After all, it's brown, and while not as cool as James Brown, it's certainly cooler than Jackson Brown - even when running on empty. Sylvia Plath's singular crazy train of a novel, the semi-autobiographical The Bell Jar details a woman's decent into madness. The seller and amateur epic movie cinematographer is asking $6,500 for this U.S. Silvia convertible, an amount that it is now up to you to determine the sanity of paying. So what do you think, is that a clean and sober price for so clean a 200SX? Or, does that price just make you depressed and bohemian?